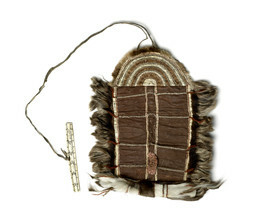 The traditional roll-up sewing bag, or kakivik – like this one with its walrus ivory fastener and trimmings of wolverine, caribou, mink, and squirrel fur – was an essential feminine possession. Girls made them to demonstrate that they had learned the skin-sewing skills that they would need as wives. In rituals, the bags signified womanhood and birth; thus when a girl experienced her first menstruation and “stood up” in the community as a marriageable woman, she unwrapped her dolls (“pretend children”) from her kakivik and gave them away to younger companions. Neva Rivers: Kakivik nutaan. Arnat pilitulriit. John Phillip, Sr.: Important-aalriig atam kankuk alailriik arnaulriani. Aka-gguq nulirniaraqateng nukalpiat yaaqvanek nani uitaluteng arnaq tauna pillruuq, “Ata kakivigka aqvaqaqernaunka.”Uniisngaunaku. Ukurritqataaquvet unisngaunakek kiigkenka aturateng ilait unitengermeng kakivik. Joan Hamilton: If somebody comes and gets you in your village to marry you, you just go home and grab this and leave. This is real critical for the woman, that you never leave this. You can just leave everything else, but you need to bring this along. Neva Rivers: Makut-gguq maa-i kelugkuaraa. Munalriim ukut pillrullinikai. Kelugquayauluteng. Virginia Minock: Tua-i-llu, tua-i-llu-gguq keluakun arnaq cakneq tangerrluki keluun uum angutem cucuknauraa, keluakun. Neva Rivers: Uggun-llu tau kenegnarcaareluuku angutem tangllerkaa. Joan Hamilton: Kelua-qaa una tangerrluku? Joan Hamilton: This [bottom, straight edge] is caribou, and then this here [darker skin] is the foot again. Joan Hamilton: Mana-mi? Mink-auguq-qaa mana? John Phillips, Sr.: Wolverine looks like (outside trim along sides). Joan Hamilton: Naken, aqsaanek maaken-qaa? Neva Rivers: Mink-am pamyua melquqaa. Joan Hamilton: Makut-mi? Kavirliq cauga? Yarn-aulliuq. John Phillip, Sr.: Squirrel-am tua-w’ wani melqurra summertime. Squirrel, qanganameng pituaput. Wangkuta-wa squirrel-ayagat kavirlitimkut narullginek pituaput. John Phillip, Sr.: Kiagmi waten ayuqut melqurit. Uskumi-ll’ qatriluteng. Aron Crowell: What is this [reddish-brown] skin in here [central rectangular section]? Joan Hamilton: That’s the same as this [caribou hair side of exterior]. Neva Rivers: Tamana tamirrluku nutaan maa-i uitermeng pillrulliniluku. Virginia Minock: This one [semicircular flap] looks like it’s seal. Aron Crowell: And this [white bands on semicircular flap] is throat skin? The esophagus? Neva Rivers: This [bag fastener] is just for hooking. Virginia Minock: Looks like ivory, huh? Joan Hamilton: Qessaitqapiareluteng [they weren’t lazy]. We were just admiring how much work goes into that, knowing the implements they had. Aron Crowell: So would the needles and sewing things be in there? Suzi Jones: So do you use something like this made out of cloth today to keep your needles in? Suzi Jones: Are they fancy or plain? Virginia Minock: They’re just plain. Joan Hamilton: Some are fancy. In Chevak, they make really fancy ones. Maa-i-llu elitnaulriit pituut [today students do that]. Tangerrsugnarqelrianek [beautiful ones]. Students make theirs differently. Some of them are really intricate with quilting. Virginia Minock: I made one for my husband too for traveling, because they have to bring needles. 1. A tuntu is a "caribou" and also "reindeer" (singular; plural is tuntut). Reindeer are domesticated caribou. To distinguish between the two, a caribou is sometimes called tuntupik or tuntupiaq (literally, "genuine caribou") and tuntu is applied to reindeer. Tuntuvak is "moose" (Jacobson 1984). 2. In the Nelson Island dialect of Yup’ik, an iqugmiutaq is a "bag fastener" (Fienup-Riordan 2005). Sewing kits were symbolically connected with womanhood and birth. For example, a pregnant woman sat on her sewing kit while cutting meat if she wanted to give birth to a girl. (3) When a girl experienced her first menstruation and “stood up” in the community as a marriageable woman, she unwrapped her dolls (symbolizing children) from her kakivik and gave them away to her younger companions. (4) Young men made bag fasteners as courting gifts, and a sewing kit’s rounded flap resembles the U-shaped bottom of a woman’s parka.